Download "Deterrence and Geographical Externalities in Auto Theft"
3 VOL. NO. APPENDIX: GEOGRAPHICAL EXTERNALITIES 3 insurance for vehicle occupants, and civil responsibility. 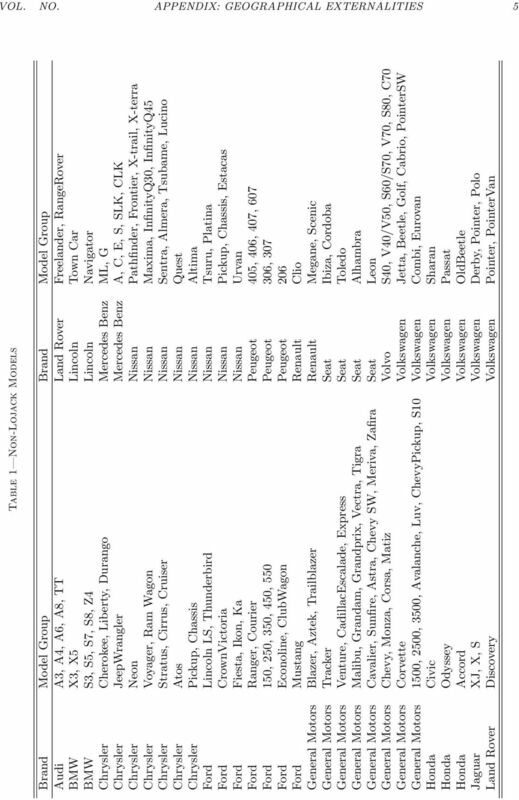 C. Specification robustness checks I report the results of three robustness checks in Table 3. The first column is the main specification from Table 2 for comparison. Column 2 addresses the fact that the baseline estimations assume independence of error terms across states. This may not be a reasonable assumption if theft risk is spatially correlated across state lines. This is especially important because three of the Lojack states are contiguous. For the externality regressions, it is not difficult to imagine that Lojack states around a particular Lojack state may share common theft risk shocks. To address this concern, I place all contiguous Lojack states into a single cluster and all non-lojack states surrounding a particular Lojack state into a single cluster. The panel shows that the results are robust to this redefinition of clusters. 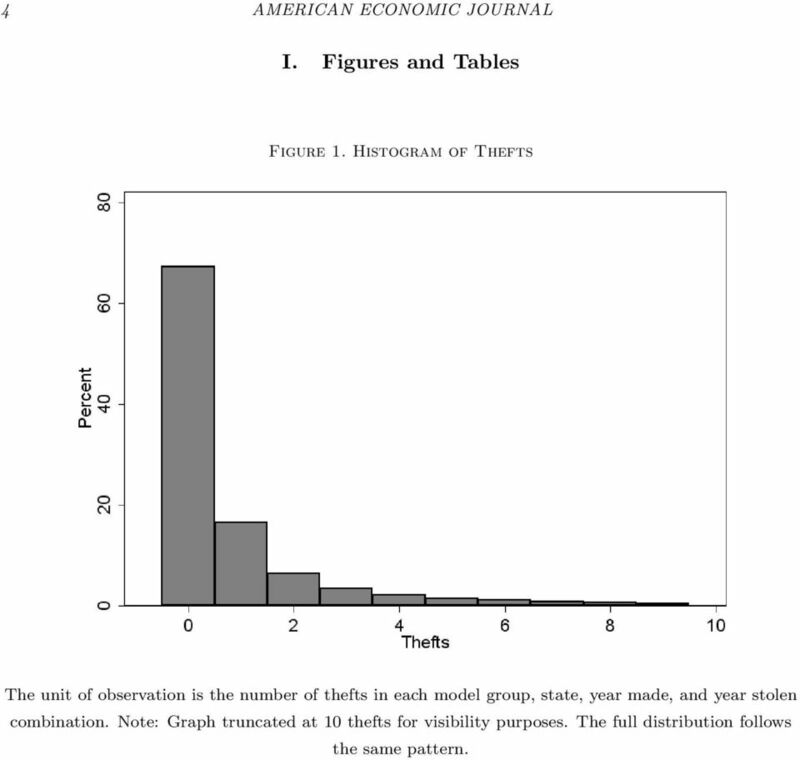 Column 3 relaxes the assumption that the theft-risk function is a one-to-one relationship between the stock of vehicles and the number of thefts (by constraining the coefficient on the stock of vehicles to be equal to one in the regression). For example, consider the possibility that the demand for stolen vehicles is simply a target number of stolen cars, independent of the stock available (See Camerer, Babcock, Loewenstein, and Thaler (1997) for income targeting in the workplace). If this were the case, and Lojack generated an increase in sales of Lojack-equipped models, then my assumed specification would show a fall in theft risk, even though Lojack only generated an increase in sales. Any feature in a car that increased sales like lower prices or more add-ons would have the same effect as Lojack. Column 3 does not restrict the vintage size variable to have a coefficient equal to one. If the targeting hypothesis is true, then the vintage size coefficient should be smaller than one and the coefficient on Lojack should be sharply reduced (in absolute value). The results are virtually unchanged from the main specification. In conclusion, the targeting hypothesis does not seem be supported in the data. Finally, column 4 explores whether Lojack state non Lojack model externalities were present in vehicles similar to Lojack models. This is done by defining LJmodel category = 1 if a non Lojack model is of the same category as a Lojack model (SUV, sedan, luxury sedan, minivan and compact car) or not (sports car, subcompact and pick-up truck). 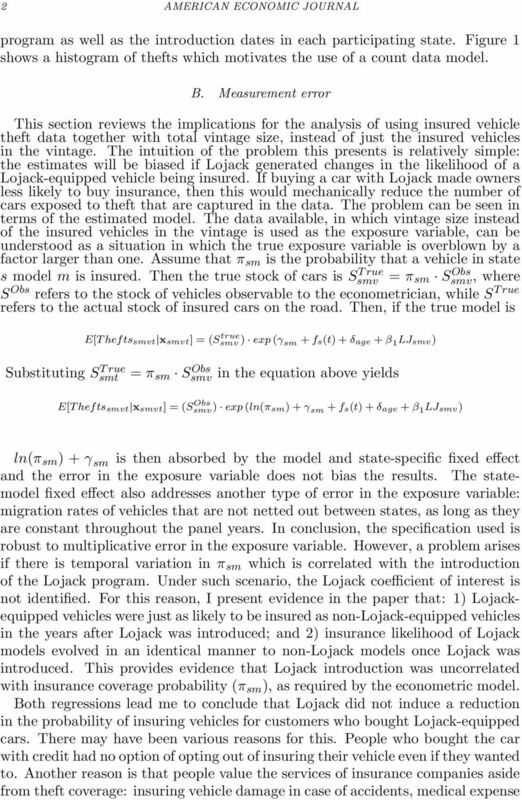 The coefficient on the interaction tells us if the Lojack externality was different among Lojack model category vehicles from those categories in which a Lojack model was not represented. 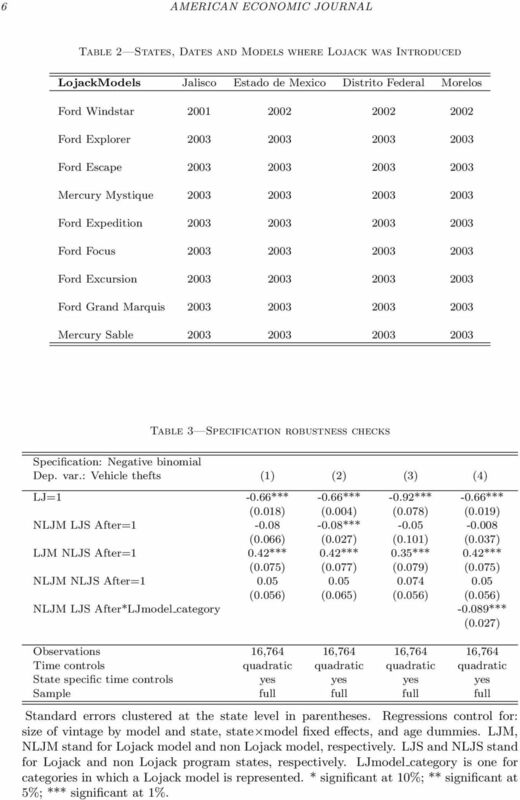 The regression result is reported in column 4 of Table 3. 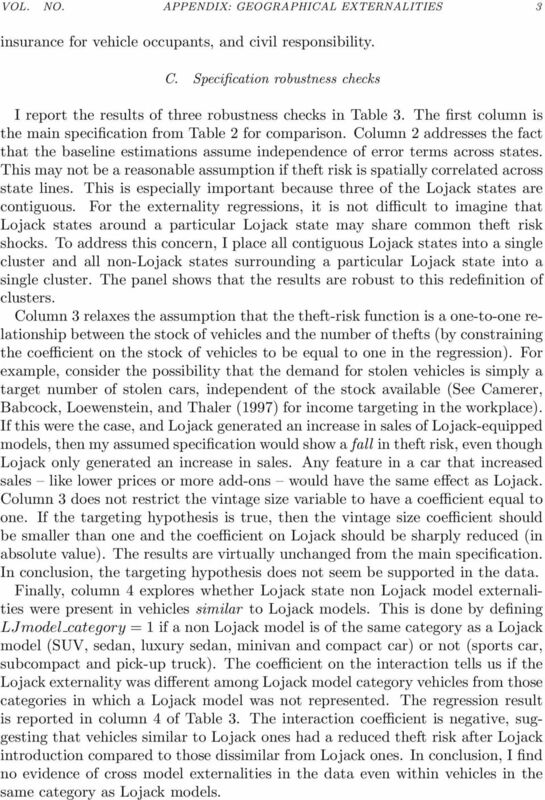 The interaction coefficient is negative, suggesting that vehicles similar to Lojack ones had a reduced theft risk after Lojack introduction compared to those dissimilar from Lojack ones. 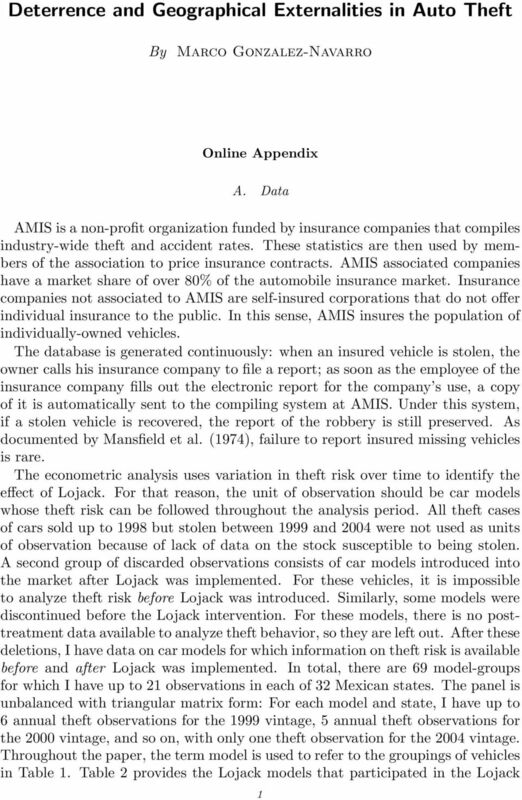 In conclusion, I find no evidence of cross model externalities in the data even within vehicles in the same category as Lojack models. 4 4 AMERICAN ECONOMIC JOURNAL I. Figures and Tables Figure 1. Histogram of Thefts The unit of observation is the number of thefts in each model group, state, year made, and year stolen combination. Note: Graph truncated at 10 thefts for visibility purposes. The full distribution follows the same pattern. 6 6 AMERICAN ECONOMIC JOURNAL Table 2 States, Dates and Models where Lojack was Introduced LojackModels Jalisco Estado de Mexico Distrito Federal Morelos Ford Windstar Ford Explorer Ford Escape Mercury Mystique Ford Expedition Ford Focus Ford Excursion Ford Grand Marquis Mercury Sable Table 3 Specification robustness checks Specification: Negative binomial Dep. var. : Vehicle thefts (1) (2) (3) (4) LJ=1-0.66*** -0.66*** -0.92*** -0.66*** (0.018) (0.004) (0.078) (0.019) NLJM LJS After= *** (0.066) (0.027) (0.101) (0.037) LJM NLJS After=1 0.42*** 0.42*** 0.35*** 0.42*** (0.075) (0.077) (0.079) (0.075) NLJM NLJS After= (0.056) (0.065) (0.056) (0.056) NLJM LJS After*LJmodel category *** (0.027) Observations 16,764 16,764 16,764 16,764 Time controls quadratic quadratic quadratic quadratic State specific time controls yes yes yes yes Sample full full full full Standard errors clustered at the state level in parentheses. Regressions control for: size of vintage by model and state, state model fixed effects, and age dummies. LJM, NLJM stand for Lojack model and non Lojack model, respectively. LJS and NLJS stand for Lojack and non Lojack program states, respectively. LJmodel category is one for categories in which a Lojack model is represented. * significant at 10%; ** significant at 5%; *** significant at 1%. Freedom of Information Request 5128 Lease Car Contracts Can you provide a description for each contract please (number of vehicles, type of vehicles-cars, vans, plant), also if this is leased or hired? Atasan Industrial Group which is located in Turkey is one of leading manufacturer and supplier of automotive parts for OE and Aftermarket. 0015 - Audi A3 (8L) 96-02. 0015 Audi A3 (8L) 96-02. Audi A4 (8D/B5) 95-00. Audi A4 (8E/B6) 01-04 -08.00 -08.00 -05.99 06.99-09.01 -05.99 06.99-09.